The deep red of this crimson garnet will stand out in this Mozambique garnet solitaire pendant from Apples of Gold Jewelry. The 14K white gold pendant holds a 6mm Mozambique garnet gemstone that will offers plenty of romance and mystery! The gorgeous cut out design on the pendant, where the AA rated garnet is situated, adds plenty of personality and creates a unique design. The overall size of this beautiful pendant is 11.4 x 6mm, and includes the hoop and bale. 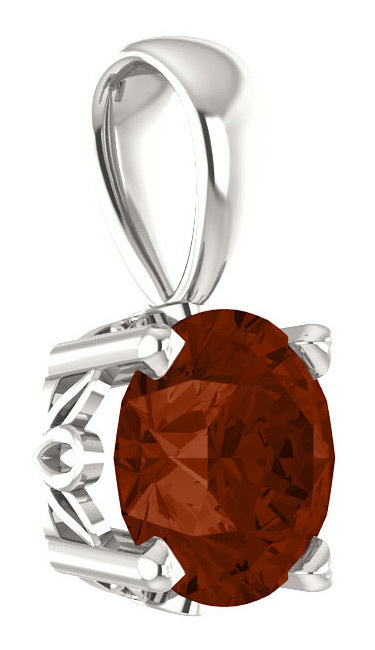 We guarantee our Mozambique-Garnet Solitaire Pendant, 14K White Gold to be high quality, authentic jewelry, as described above.